Everyone in government who deals with eligibility checks knows that they need to be more efficient, and work better for users. 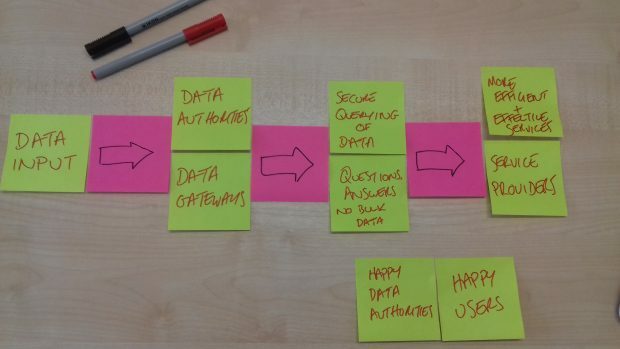 The Personal Data Exchange team are exploring ways to make this easier by prototyping a simple and secure way to digitally check eligibility using personal data held by government. We’ll discuss how we’re doing this work in this blog post. Around 50% of government services require users to prove their eligibility. This often means the user digging out a letter or other official document that shows they meet the criteria, photocopying it and sending it to the government body providing the service. The teams running that service then have to assess and process this evidence. Currently documents are manually sorted, checked and returned, so users have to endure long wait times. It’s an inefficient process. If the evidence is not quite right, service teams may need to ask the user for clarification or to provide more information. They may also have to contact the part of government that issued the documentation in order to validate it. This takes time and effort for both users of the service and those providing it. There is an opportunity to save this time and effort by making better use of data. An official document contains important information - personal data - that is stored by the part of government that issued it. With the right data infrastructure, services could safely and securely check that data directly at its source. This means that users would not have to provide evidence and services would not have to manually check eligibility. Instead, the eligibility checks required for services would happen digitally and in real time. This would provide substantial benefits for both users of services and those who provide them. In most cases, services require more than one piece of evidence from a user to work out if they are eligible for a service. The information they need, and how it is combined, depends on the individual service. Each piece of information may have originated from a different part of government. Government departments maintain and store their data independently. Each department’s system for how data is handled has evolved over time to meet unique needs. Conducting eligibility checks across government requires two-way trust. Those who hold data in government are acutely aware of their responsibility to protect that data. So, it’s important that they are confident that any access to data is safe and secure. Equally, services need to be sure the data they rely on is accurate and up to date. Personal Data Exchange is working to help overcome these three challenges by building a network that converts complicated eligibility criteria into specific questions. These questions can be digitally checked against existing personal data in government to return answers about whether or not a user is eligible for a service. This network is flexible so that it can be used by different types of services checking different sources of data. We will also create best practice legal and assurance frameworks that can be linked with the technology. This means that it will be more straightforward to set up formal data access agreements, with technology that controls exactly who is able to query which datasets and for what purpose. The Personal Data Exchange solution has the potential to transform how data is checked across government, making it quicker and easier for services to assess the eligibility of users. Instead of these users spending days working through a manual eligibility check, they will be able to find out instantly if they are eligible for the service they’ve applied for. We can’t wait to share more about the role our team is playing in making things better for users of government services. Keep a lookout for blog posts coming soon on Personal Data Exchange’s technical architecture and the designs we’re testing with services. You can also get in touch by email. I work within Childcare Service (HM Revenue & Customs), which is the new flagship cross-government 'digital by default' service and it is interesting to see the "front-line" implementation of this. There are definitely many advantages to automatic eligibility checks, but also challenges within the software development sphere. Absolutely agree, Ian. Our ultimate objective when it comes to eligibility checking is to help citizens (i.e. the data subjects you mention) prove their eligibility for services so they can get the service they want as quickly and as seamlessly as possible. We’re exploring how best to support the providers of those services by providing a digital and data minimal way of getting the information they need to make eligibility decisions quickly and accurately. We mustn't forget that it is also really important to build and maintain trust with the data subjects too - the people who are accessing the government services. Being open and transparent about the data that is being shared, and how the data is being shared, is a key part of this. As is asking for informed consent wherever possible.